I read this article and found it very interesting, thought it might be something for you. The article is called Bihar’s Political Dynasties: 7 Win, 15 Lose and is located at https://archive.indiaspend.com/bihar-votes-for-its-and-indias-future/bihars-political-dynasties-7-win-15-lose-22287. Of 22 political dynasties that contested the recently concluded Bihar assembly elections, seven families won and 15 lost. The Bharatiya Janata Party (BJP) had fielded eight candidates from these 22 families, the Lok Janshakti Party (6), the Janta Dal (United) (5), the Rashtriya Janata Dal (3), the Hindustan Awami Morcha (3), the Samajwadi Party (1) and one independent. The first family of Bihar politics – Lalu Prasad, two sons and a daughter – recorded 100% victory in the seats it contested. Tej Pratap Yadav, the elder son of the RJD chief Lalu Prasad, won from Mahua constituency by defeating the HAM’s Ravindra Rai by a margin of 28,155 votes. Tejasvi Pratap Yadav, Lalu’s second son, won from Raghopur by defeating the BJP’s Satish Kumar Yadav by a margin of 22,733 votes. 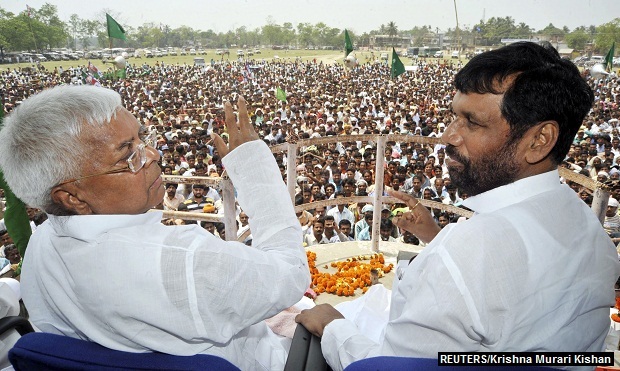 Satish Kumar, earlier in the JD (U), had defeated Lalu’s wife Rabri Devi from the same constituency in 2010. Santosh Suman, son of former Chief Minister Jitan Ram Manjhi and leader of HAM, lost to Rajesh Kumar of the Congress by a margin of 10,098 votes. Maheshwar Hazari, son of former JD (U) MLA Ram Sevak Hazari, won against the LJP’s Prince Raj with a margin of over 47,000 votes. Prince Raj is the son of Ram Chandra Paswan, brother of LJP president Ram Vilas Paswan who is also the union minister of consumer affairs, food and public distribution. Pashupati Kumar Paras, brother of Ram Vilas Paswan, lost to the RJD’s Chadan Kumar by 24,470 votes in their bastion at Alauli. Paswan’s son-in-law Anil Kumar lost to Beby Kumari, an independent candidate, in Bochaha by a margin of 60,337 votes. Paswan’s daughter-in-law Sarita Devi lost to the JD(U)’s Ratnesh Sada by 53,763 votes in Sonbarsha. Ravi Paswan, son of Cheddi Paswan (Member of Parliament and former MLA) lost to the Rashtriya Lok Samata Party’s Lalan Paswan from Chenari constituency. Sanjeev Chaurasia, son of BJP leader Ganga Prasad, won from Digha against the JDU’s Rajiv Ranjan Prasad by a margin of 92,671 votes. The BJP’s Rana Randhir Singh, son of Sitaram Singh (a former Member of Parliament), won by 61,504 votes against the RJD’s Shivji Rai from Madhuban. Vivek Thakur, son of BJP vice president CP Thakur, lost to Shambhunath Yadav of the RJD by a margin of 30,776 votes from Brahampur. The BJP’s Nitish Mishra, son of former Chief Minister Jagannath Mishra, lost to Gulab Yadav of the RJD by 834 votes at Jhanjharpur. It still does not mean Bihar has buried dynastic politics.